Baptists in the South, rapidly rising to challenge Methodists numerically, helped align Southern religion with the South’s black slave culture. The birth of the Southern Baptist Convention in 1845, formed in order to preserve God’s will for the African race, signaled the inevitability of war. Middle Georgia remained outside the front lines of the war, the region’s relative intactness allowing for the continuation of church life during the war years. While many white Baptists from Middle Georgia marched off to war—whether to fight or to serve as chaplains or army missionaries—others stayed behind and voiced their thoughts from pulpits, in associational meetings, and in the pages of newspapers and journals. While historians have often portrayed white southern Baptists, with few exceptions, as firmly supportive of the Confederacy, the experience of Middle Georgia Baptists is much more dynamic. Far from being monolithic, Baptists at the local church and associational level responded in a myriad of ways to the Confederacy. Patterns locally and associationally emerged and evolved as the war progressed, while differences between Southern and Primitive Baptists stood out. On a personal level, white Baptists’ views of slavery and the Confederacy proved to be varied, numerous, nuanced, and dynamic—to such an extent that some individuals were unable to construct a consistent narrative as the war progressed. For their part, black Baptists struggled to shape their own destinies within a white man’s world, strivings that grew more intense as the war progressed and freedom seemed within reach. The end of the war signaled new realities for both white and black Baptists of the South. For whites, old loyalties had been rearranged and the immediate future was bleak. At the same time, black Baptists emerged empowered as never before and set forth on the path of self-determination. ...At its core, Gourley?s work is not only revealing, but it is also wholly readable and entertaining. Diverging Loyalties will certainly satisfy enthusiasts of the Civil War and American religion, yet those with only casual interest will also find themselves engaged with the content. Not only does Gourley explore a localized view of the daily tensions of the War, but he also successfully presents the social transformations that occurred during it. Historians have long contended that Civil War experience was a distinct one for its many participants, and Gourley?s narrative truly echoes this assertion. This provocative and comprehensive study not only offers much needed documentation of Baptist responses to slavery and the Civil War but also offers a case study in wider cultural and religious dynamics in one segment of the Confederacy. A well written, well documented and insightful analysis of an important epoch. 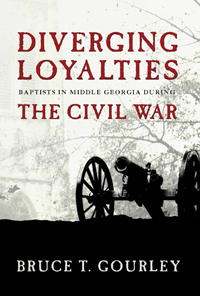 Bruce Gourley’s analysis of Baptists in middle Georgia during the Civil War is a masterful balancing act. He places his historiographical interpretation in the context of virtually every other important interpreter, while “on the ground” he pays close attention to real Baptist voices in real Baptist church records. His ability to listen to the contemporary debate over the role of religion in the Civil War, while telling the stories of actual Baptists in Georgia who lived through it, will stimulate useful conversations among scholars and Civil War buffs alike. Conventional wisdom maintains that white Baptists in the Deep South strongly supported the Confederate cause. Bruce Gourley's nuanced examination of Middle Georgia instead maintains that class and local concerns consistently produced a spectrum of responses, from fervent loyalty to apathy. His conclusions will force a reassessment of the relationship between church and the Confederate state. Grounded in a close study of local and regional records, this is revisionist history of the best kind.